There have been tremendous changes in the roofing industry over time. With newly emerging businesses and a competitive market, the industry has become more advanced and innovative. Basic tools are replaced with high-quality upgraded products in order to provide best customer satisfaction and make a mark in the market. Roofing manufacturers are concentrating not only on basic roofing products but also developing more products for customer safety. This type of roofing is done with the terracotta tiles, which are made usually made up of clay. The terracotta roofing system is quite suitable for houses in areas where the heat level is very high as the terracotta tiles are good heat absorbers. Terracotta roofing is quite rough and tough and can face bad weather. These roofs include shingles usually made up of cedar. They are costly as compared to other roofing systems, due to its craftsmanship and the installation/maintenance cost. The wooden shingles give a grey metallic rich look after some time, which is why they are often used it in retro structures or classic bungalows. These tiles are also coated with a fire retardant. This type of roofing is commonly done with the help of metallic sheets. It is one of the oldest types of roofing. However, these days the metallic roofs come with anti-rust, anti-leak and fire-resistant technology. Also, they are low maintenance and reflective shine on the roofs. Metal roofs are very durable. In addition to the common standing-seam panels, metal roofs can be manufactured as shingles/slate, or metal tiles that have the graceful curves of classic tile, but the lightness and strength of steel. And metal shake serves as an alternative to traditional wood shake roofs, presenting an authentic look of wood, while gaining a variety of color choices with longer lasting, fireproof metal. One of the most common types of the roofing is made from asphalt shingles, which are not costly and are easy to maintain. Asphalt shingles offer a wide variety of choice between colors, shapes, and sizes of shingles. These shingles are easily repairable and replaceable. Roofing contractors can merge asphalt shingles with other roofing materials in order to give the roof a different look. These shingles are new to the market and are specially made for households or commercial buildings to generate power through solar energy. As the name suggests, Solar shingles are photovoltaic modules that capture sunlight and transform it into electricity. These roofs are made with different sizes and shapes of slate. They are very durable and dependable, but the heavy weight of the material needs to be carefully managed by the installers. 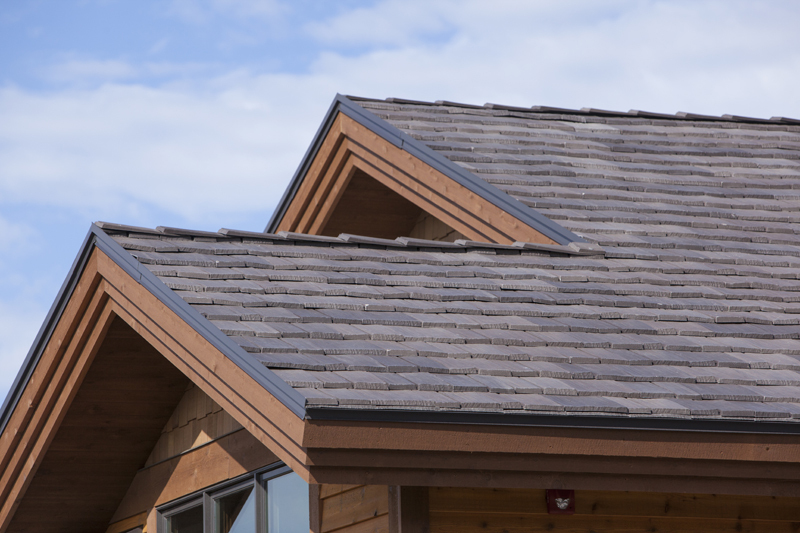 Slate is a natural material and a recyclable product. Apart from the above-mentioned roofing systems, other materials such as concrete, ceramic and clay are also used to make roofing tiles. These tiles are also quite reliable and are available in different shapes and sizes. Note that certain lightweight ceramic tiles need to be handled carefully during installation and maintained on a regular basis. Composite or synthetic roofing is available in patterns that resemble wood shake, but last two to three times longer than both wood and asphalt. Synthetic roofs are also available in the look of late shingles, featuring the same beauty and durability but at a lower cost. These synthetic shingles are polymer-based, which means they are made of plastic and rubber. They are lightweight, eco-friendly, recyclable and resistant to mold, fungus and rot. They do come at a higher price than asphalt shingles, for example, but the quality and energy efficiency make up for it, so it is sound investment. Most roofs are nearly impossible to reach without a suitable ladder. 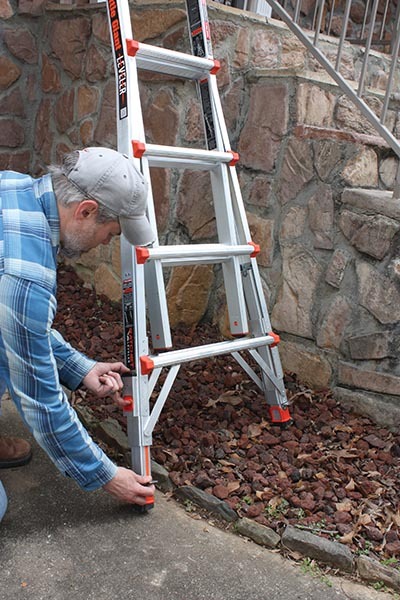 Earlier roofers made use of traditional wooden ladders, but today the use of adjustable and foldable metal ladders is increasing because they can be adjusted as per the height of the eaves. Also, these new types of multi-ladders can be folded and easily moved from place to place. As the roofing process involves a lot of nailing, a hammer is one of the must-have tools used to nail various parts of the roof and to remove any fasteners that are wrongly nailed. There are various types of hammers available that are designed for specific types of roofing. 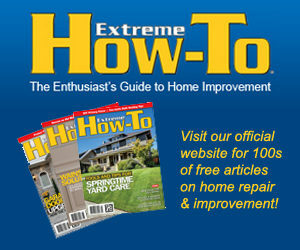 An air-driven roofing nail gun is one of the key tools a roofer should have. Roofs need to be securely nailed throughout the installation, and an air nailer makes this process very fast and easy. There are different types of handy nailers that are easy to use and possess the different capacity to store nails of different sizes. A roofing hammer-tacker looks similar to a paper stapler but has much more power. It is used to nail the roofing felt or underlayment, much like a stapler does to paper. 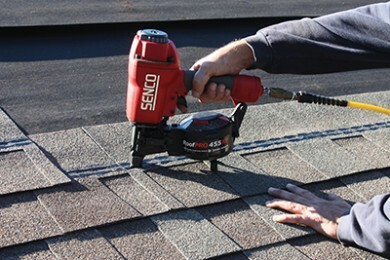 This tool is mostly used in the repairing or renovation of a shingle roof. A standard shingle remover has a flat metal base with metal teeth that make the removal process easier. However, there are many advanced types of shingle removers available in the market for different types of roofs. Roofing is a very risky business, which is why the main concern of the roofers should be their safety. Roofers should be well trained and aware of the consequences in case of accidents. Extreme weather conditions such as heavy rains or severe cold make roofing conditions hazardous, and roof work should be avoided. The roof is sometimes located near bundled wires, antennas, television dish plates, etc. Short circuits or loose connections can risk electrocution. The best safety device to prevent injury from falling off a roof is for the installer to use a fall-restraint harness properly anchored to the roof ridge. In order to safeguard oneself, it is advisable for the roofers that they wear helmets, knee and elbow pads, gloves, etc. However, damaged ladders or worn gear can lead to unexpected injury. It is the duty of the roof installers as well as the contractors to check their tools on a regular basis. The roofing industry is constantly growing, and tool companies are responding by developing new safety gear to meet the challenge. What Is Asbestos and Its Exposure Risks?